FLASH CRASH Of Civilization Risked. And Why. In the famous Terminator movie, a worldwide automated defense net takes over and launches strategic missiles all over, annihilating much of humanity and nearly all of civilization. Science-fiction? Not at all. In 1979, the strategic command of the USA saw on its screens a Russian attack by 200 intercontinental missiles, enough to annihilate the USA. There were only minutes to launch a counter-strike. Panic ensued. Bombers were scrambled. The presidential plane took off, without the president. And so on! A smart general found that a training tape had been inserted by mistake. Alleluia! Nuclear Armageddon avoided this time. The financial system has been riddled with “computer glitches”. Except they are not really glitches, but part of the war hyper rich financiers are waging against We The People. The robots we have put in charge do not have to respect Asimov’s First Law Of Robotics, which is that a robot should not hurt a human. 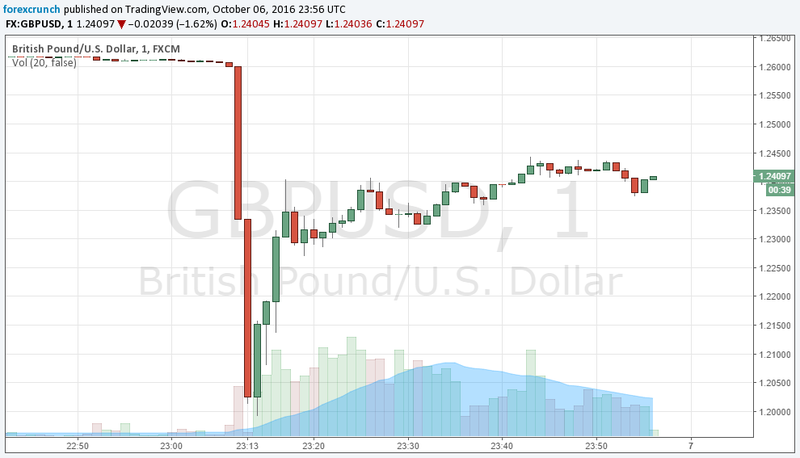 LONDON—For a startling moment on Friday, the British pound crashed. In just three minutes shortly after 7 a.m. Hong Kong time, the pound sank 6% to as low as $1.18, according to Thomson Reuters data. Some electronic platforms recorded scattered trades near $1.15. For the currency markets, where moves are recorded in thousandths of a penny, it seemed that currency traders were all hiding under their desks. The most accepted scenario was that computers, not humans, were the ones that refused to buy. Coming at the most thinly traded moment of the global trading day, the latest “FLASH CRASH” once again showed how algorithmically driven trading programs have rewired the global finance game. So why do we have hair-trigger systems all around the planet, with malevolent robots in charge? The basic trick is this: hyper rich individuals, employing armies of physicists, mathematicians and programmers have set-up automatic systems to trade faster than individuals can. That’s called “high frequency” trading. High frequency trading is made possible by NOT taxing the sort of transactions the hyper wealthy are allowed to do. Normal people get taxed, the financially wealthy do not. Flashback on 10,000 years of civilization: when the hyper wealthy does not get taxed, one has an aristocratic system: that is both the major cause, and major symptom. Taxing small financial transactions would limit their speed, hence re-establish the notion of causality (that fact comes straight from knowing the fundamental physics which is deeper than the Theory of Relativity). We are led by cretins. Russia and the USA have produced magnificent examples of complete cretins, put in command to instill deeply flawed strategies. And no, I am not just thinking of Trump, Clinton, Putin, Obama, etc. Let me go back on my question earlier, and generalize it a bit: Why do we have hair-trigger systems all around the planet, with malevolence in charge? At first sight, it is because we are led by cretins, who do not see the danger. That certainly is partly true, but it’s not the whole truth: how could they be that dumb? Indeed, the danger is surely obvious, from the financial markets to nuclear war. Then what? We are led by people who do not mind the danger that they inflict to humanity and civilization, because, meanwhile they satisfy their greed, or will to power. In a way, to help engineer a giant catastrophe is surely a way to satisfy one’s ultimate will to power. As the French King Louis XV used to say:”Apres moi, le deluge” (“After me, the flood”). An even deeper question is why did it come to this. Societies have moods. Those moods are caused by (imaginary or not) facts, habits, experiences, hopes. In the end, they influence hormones, not just in the masses, but in the individuals. Those hormones, some of them neurohormones, in turn change the logic individuals are capable of. When he was still facing some opposition inside Germany, Adolf Hitler sneered that his opponents did not matter because “we already own the youth”. Hitler knew that he had molded the minds of German youth by creating an emotional ambiance which had turned into a mass driven hormonal, not just logical, Nazi setup. It was a case of mass procreation of Nazism. That Thatcher-Reagan-Neoconservatives mindset forsaken by humanity, propagated around the planet: France, Russia, fell to it later, with catastrophic results . That mindset focused on greed as the ultimate motivation is why Obama, a great admirer of Ronald Reagan, setup Obamacare the way he did, articulated by private companies looking for profits. In other words, the ultimate good motivations of humanity, are supposed to be greed, and the closely related, and more general, will to power. The ultimate motivations are not supposed to be the will to care, or love. (Whereas, in truth, without love and care, there can be no humanity, to start with! Greed and the Will To Power are secondary motivations, sorry, Friedrich Nietzsche). So here we are with more and more hair-trigger system. What is the interest of hair trigger systems, holding the entire civilization in its cross-hairs, or cross-hair systems making society ever more unjust, with some having all the power? The interest of hair-trigger systems as gods is that it tells everybody, deep down in their bones, at the deepest level of the emotional system, that greed and will to power are the ultimate good: they are worth going back to the Middle Ages, in a flash, with massive inequalities, or even back to the Stone Age (for the few survivors). Hair trigger, total destruction systems do not just celebrate will to power in its ultimate form, extermination. Having everything, from liberty, to equality, to fraternity, and even survival, at the whim of computer glitches is an expression of the will to collective suicide, and mass mayhem. Some will say, such desire for appalling destruction is surely not an instinct? Quite the opposite. The will to appalling destruction is the ultimate human, all too human, instinct. Let me sketch the explanation. It goes deep in the bowels of evolutionary psychology, in its all too human variant, which no other animal has to that extent. For millions of years, humanity has ruled the Earth, and increasingly so. The enemy of humanity was humanity itself, too much humanity, way too many humans. (At some point, a bit more than a million years ago, there were 14 humanoid species in East Africa alone.) To re-establish an ecological balance, humanity had to be culled. Now there are thousands of times more humans, so we need industrial means, computer glitches, nuclear war, and massive inequality. However, understanding this will to collective suicide and mass mayhem logically will unbalance our stealthy collective subconscious, and the pernicious topology of its emotional ways. Something excellent philosophy has always done. It goes without saying that all too traditional humanism has nothing to say about the preceding. And that is why it has become so irrelevant to what seriously matters, and why ‘progressives’ are so adrift. Humanism is not static. As technology progresses, our humanism has to become ever more subtle and powerful, just as, and because, our technology does so. Ever more power is what has defined ever more humanity, but all that ever increasing power, can only be managed with ever more intelligence. Polls show that two-thirds of Americans want taxes to be raised for taxpayers earning more than a million dollars a year. It’s not happening. Obama is pushing for the TPP, the Trans Pacific Treaty, which democratic presidential contenders oppose. All over, public opinion has been cornered into impotence: the public wants one thing, they tolerate the opposite. The public’s mind has been made into boiled pasta: easy to gobble, no backbone. As I have explained for more than a decade, this is nothing new. This exponentiating growth in wealth, and thus power, for the few is how the Roman REPUBLIC was destroyed (and replaced by the despicable and stupid Roman plutocracy, aka “empire”). The same phenomenon also happened when the Imperium Francorum (Empire of the Franks) went from the mild plutocracy known as the “Renovated Roman Empire” to the hard, abusive and demented plutocracy of the Late Middle Ages, “Renaissance”, and “Enlightenment”. “They are overwhelmingly white, rich, older and male, in a nation that is being remade by the young, by women, and by black and brown voters. Across a sprawling country, they reside in an archipelago of wealth, exclusive neighborhoods dotting a handful of cities and towns. And in an economy that has minted billionaires in a dizzying array of industries, most made their fortunes in just two: finance and energy. “In marshaling their financial resources chiefly behind Republican candidates, the donors are also serving as a kind of financial check on demographic forces that have been nudging the electorate toward support for the Democratic Party and its economic policies. Two-thirds of Americans support higher taxes on those earning $1 million or more a year, according to a June New York Times/CBS News poll, while six in 10 favor more government intervention to reduce the gap between the rich and the poor. According to the Pew Research Center, nearly seven in 10 favor preserving Social Security and Medicare benefits as they are. 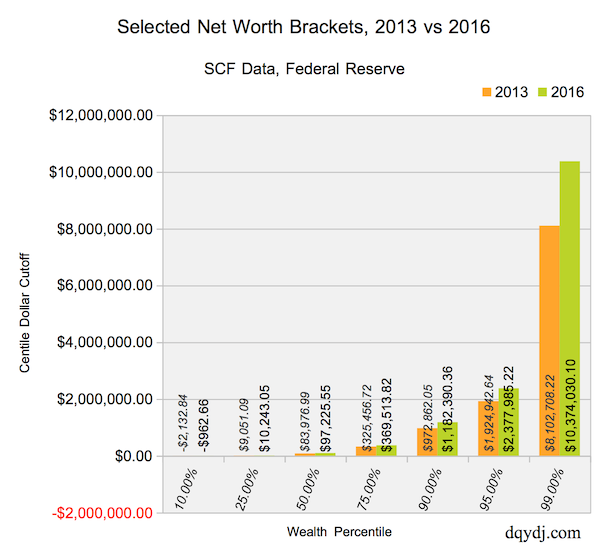 What does the concentration of wealth at the top do? Mostly shape minds in a way which serves the top guys. Another technique is to (implicitly) present banks, and the money-changers as the savior of humanity (the New York Times’ Krugman does this), while not talking about Too-Big-To-Fail banks, Shadow Banking, or the dark connections between banking, derivatives, and politicians. Angus Deaton, the Nobelist from Princeton University, has looked at the Dark Side: he observed that a lot of financial help to poor countries backfires, as it makes more sustainable for governments to mismanage the society and economy they rule. So the problem with development is more governance (what I call “empire”) than anything else. 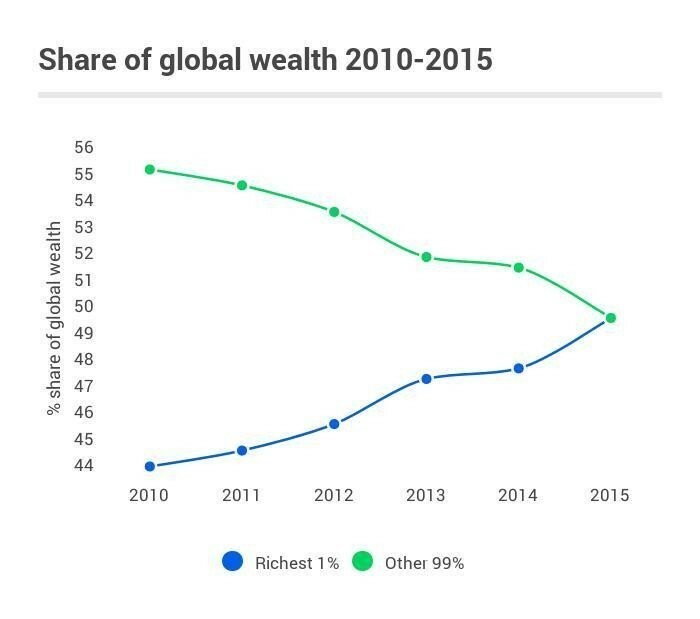 Governance is failing worldwide, and this explains why 80 plutocrats are richer than the rest of the world combined. The recipient of the “Prize of the Bank of Sweden in Economic Science” is a harsh critic of economic aid from rich countries, like the United States of America, to poor countries. “I have come to believe that most external aid is doing more harm than good,” he wrote in his 2013 book, “The Great Escape.” “If it is undermining countries’ chance to grow—as I believe it is—there is no argument for continuing it on the grounds that ‘we must do something.’ The something that we should do is stop.” The Scottish born Deaton, indeed, is not afraid of controversy: he questions the widespread presumption that rising inequality is always a bad thing. In other words, Deaton dares to say aloud that the hysterical pursuit of wealth may be good for economic activity. But Deaton claims to have found evidence that wealth brings happiness… until an income of $75,000 income. After which it starts to backfire. This is in particular true for morality. The word “moral” was coined by the lawyer, Consul, “new man”, progressive, and philosopher Cicero. Cicero was looking for a word originating from Latin that would adequately translate the Greek “Ethikos”. That latter word, in turn related to ethos, the disposition, habitual character, ‘genius’ of a people. So Cicero went for “moris” genitive of mos (same meaning as the Greek ethos; mos is related to a Proto-Indo-European mood, mode, Mut (German for courage), etc.). [Economics Nobel Prize] Paul Krugman relates in “Broken Windows And American Oligarchy” how Chief Executive Officers’ drive to grabbing all the money for themselves, may have come from watching American football stars earn enormous compensation for euphorically bashing their brains in public, while on drugs, wearing pantyhose. I have long thought, for decades, that it is literally immoral to watch American football (and I liberally despise those who do; this includes family members tight with Obama, I want them to know, lest they are too comfortable). ….”it’s all the fault of Monday Night Football. [A business man’s] story went like this: when games started being televised, the financial rewards to winning teams shot up, and star players began being offered big salaries. And CEOs, who watch a lot of football, noticed — and started saying to themselves, “Why not me?” If salaries were set in any kind of competitive marketplace, that wouldn’t have mattered, but they aren’t — CEOs appoint the committees that decide how much they’re worth, and are restrained only by norms about what seems like too much. Football, so my conversation partner averred, started the breakdown of those norms, and we were off to the races. I am happy to see that my psycho interpretation of history is gaining ground. No, ladies and gentlemen, please do not believe that your everyday little activities, down to drinking beer, do not have to do with your highest ideas. Napoleon, rightly, pointed out that an army marched on its stomach, and Nietzsche, that one thought, with one stomach (something rediscovered by 28 year old Giulia Enders, whom TV networks love to show in detail how pretty she is; she sold already more than one million of her book on the stomach… “with charm”). At least, this is what the Ancient Greeks and Romans thought. The very idea of morals recognizes that lack thereof will lead to the contagion of immorality. Thus that immorality propagates like a plague has been recognized for more than 26 centuries. Then the Athenian legislator Draco set-up a legal system which punished most offenses (such as stealing a cabbage) with the death penalty. The notion can be fruitfully used today: minor offenders can be arrested and their DNA can be documented. As big offenders tend to start as small offenders (that’s the point when they become immoral), as they commit a big crime, their DNA collected during their previous small crime will often allow to identify them. Hence the increasingly fast and accurate detection of big crimes nowadays. This is discouraging for would-be big time criminals, so the big time crime rate is plummeting. However, internationally the effect can play the other way: when states see that aggression by other states is not punished, that immoral behavior is in plain sight, and nobody does anything about it, then immoral states so far rather innocuous tend to join in mayhem. This is why, in the 1930s, war and bad actions by states spread around the planet in a few years. In the same spirit, the Nazis executed 200,000 handicapped people, starting in October 1939. The idea was not just to see if they could get away with it, but also to habituate the population to general moral depredation: their cooperation would be needed when millions were to be assassinated at their doorstep (an extermination camp such as Dachau was in Munich’s suburbs, and so were many camps next to urban areas; there was an astounding 20,000 Nazi concentration and extermination camps!). More generally this is why one war does not generally happen alone, and why tolerated international abuse tend to lead to apparently unrelated wars in the same time frame. Hence a war such as the one in Syria has a general deleterious moral effect for all those who hear about it, or watch it, and learn to tolerate it. It is no coincidence that Putin decided to invade Ukraine after he saw his domestiques in England saw nothing wrong with their investor, Bachar El Assad, and Obama called off the Franco-American strike against Syria with minutes to spare. The lessons of 1930s is that imperial racist aggressions from fascists in Italy, Germany, Japan (and also the USSR, and a few other smaller powers) would not have been allowed to propagate, if Great Britain and the USA had stood with France. Instead, they stood with Hitler, and Mussolini (through various treaties, and investment, combined with an anti-French attitude). Seeing this, the Japanese high command, and Stalin, felt much encouraged (and secondary fascists in Eastern Europe, Portugal, and Spain). Thus, right now, it is important for democracy to bark in a timely manner. And to show some bite. The fascists of the 1930s really believed (headed by Hitler) that democracy was weak. That impression ought to be dispelled in a timely manner. Lest we want mayhem. Those who want a better morality long towards love, conversation. Due to their will to goodness, they tend to forget that all which exists is the result of force. The kindest type of force is debate (from the Thirteenth Century French debatre, to beat completely). However, morality is always imposed by force. Cicero himself, as a Consul, came to that conclusion. In the aftermath of the Second Catilinarian Conspiracy, Cicero, unfortunately (?) executed the five main conspirators without due process. Later, before and after Caesar’s assassination, Cicero tried to use force for the best, in his attempt to save the Republic. First supporting Caesar, and, then, as the most Senior Senator Octavian (against the much more fascist Marc-Antony). 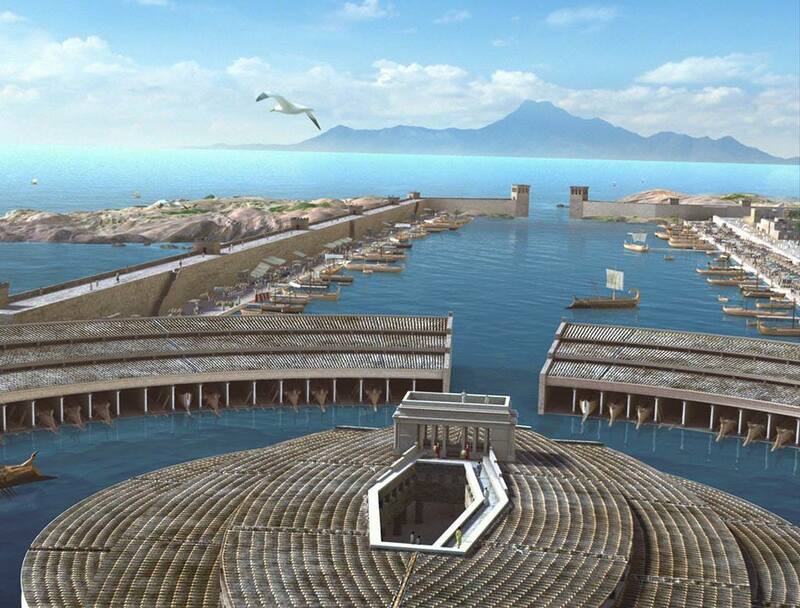 Marcus Antonius had Cicero’s hands and head nailed on the Rostra, for all to see. After Marcus Antonius’ wife had repeatedly stabbed Cicero’s tongue with an hair pin, to extract vengeance from his power of speech. After such horrors, the path was paved for 2,000 years of plutocracy, and the rise of American football, and how it impresses weak minds, and made greed into the only morality worth having. Meanwhile, just as impressed, by this generalizing degeneracy of morals, the North Korean dictator is piling as many nuclear bombs and intercontinental missiles as he can, while the USA president plays golf, and obsesses about free trade for his wealthy friends. This requires discipline. So the dictator fed his uncle, who had put him in power, to dogs (some say it is not true; official pictures, though, show that the uncle was definitively not happy, humiliated and uncooperative). Now the young, “Western educated“, dictator, has been betrayed by the lack of respect of his Defense Minister, and he, as dozens of other North Korean officials, was executed (possibly with anti-aircraft guns, in the presence of many officials). In such a moral ambiance, who can doubt that the present North Korean dictator will not order the execution of whoever, even millions, perceived to be in his way? As examples teach, and create minds, one should not forget that plutocracy inside the West causes much more vicious plutocracy out there. But, out there, is much capacity for mayhem, thanks to weapons of mass destruction. Such weapons of mass destruction do not have to be gross. Canada’s just announced perfidious CO2 targets are an example of mass violence with a hopeful face. In truth, Canada, whose CO2 emissions have constantly augmented in the last few decades, is exactly giving the worst example: it will soon produce 40% of its CO2 emissions from just one province, Alberta, out of greed, producing tar sands oil. One should expect dictators and plutocrats to pay attention, worldwide, to Canada’s immorality, and triumph of Earth slapping greed. And to be inspired accordingly. Thomas Piketty, a young and successful French Science Po economist wrote “Capitalism in The XXI Century”. I bought it ASAP, and then did not read one page. The reason is that there was a waiting list. By the time I got the book, it was clear it was rehashing part of what I have been saying for years. For example, to my knowledge, I was the first to make the rapprochement between the present situation and the Ancient Regime. 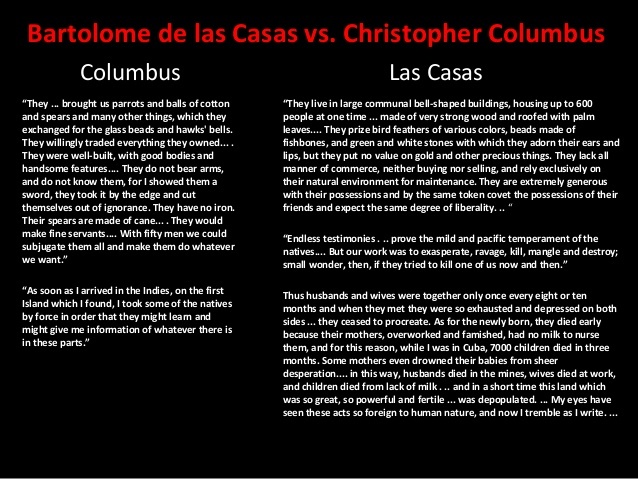 The Nobles (2% of the population) did not pay (most) tax. Piketty recognizes that he just discovered “his book’s principal idea” that the “taux de rendement du capital” (return on capital) was higher than return on work. “Moi je ne le savais pas avant”. I have been pounding that fact for a decade or so. It is nice to see Piketty saying these things I have been saying, now, but I have moved on, long ago. I condemn the very way money is generated (by the private-public banking system). It is first obvious to whoever has studied past societies. Plutocracies are basically those societies where, at some point, taxation on the wealthiest has not been applied enough to limit the EXPONENTIATION of capital. I do not find alluring to listen to my old observations. Not to demean Piketty. Others such as Saez in Berkeley, also French, had published enlightening research on inequality, for years. I agree with all what Piketty proposes. Yet, many of his answers are all too mild. 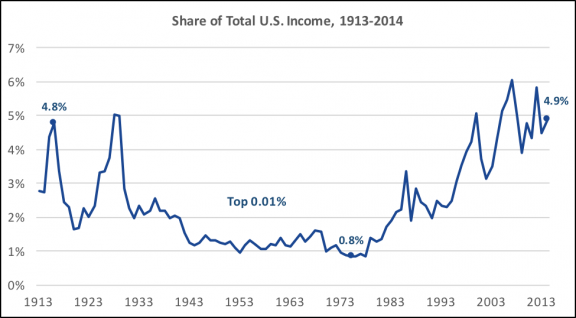 In the period from Roosevelt to1981 (arrival of Reagan), the upper marginal tax rate of the USA averaged 82%. It applied above one million dollar income (constant dollars). Growth was maximum. 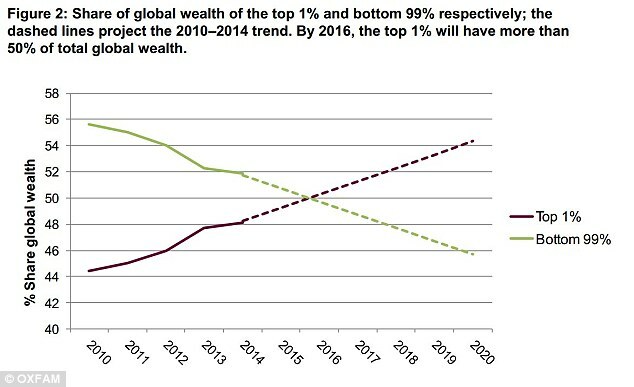 What Piketty did not say: In the next 20 years the maximum margin on the richest came down to (less than) 15%. Yes, less than secretaries. 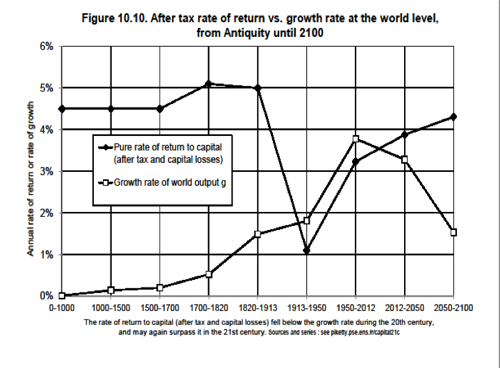 Piketty wants to rise the upper margin tax rate of income millionaires to 80% or 90%. I agree. To this critics of Piketty, in France or the USA, reply that will kill innovation. A French cutie interviewer told Piketty that with rates like that the robot who heads Facebook (OK, she did not use “robot”) would not have been motivated to invent Facebook. As it is, Mr. Z from Facebook stole an idea from France. Besides, Facebook-like companies already existed (Myspace). There is also plenty of evidence Facebook was a government operation (the protégé of Larry Summers, parachuted to the USA government under Clinton, was parachuted to Google, and then parachuted to Facebook). Piketty vaguely mumbled something about the research which really mattered was public. But he was weak and indecisive. Why? Well, after all, Piketty teaches at Science Po, a place full of young arrogant greedsters who think they are becoming qualified to lead the world. They live according to a principle that Piketty himself condemns: politics as a profession. Piketty said that the fact Hollande had been in politics all his life was a problem (the same is true for roughly all politicians). Professional politicians should not be condemned to clean the toilets exclusively, but certainly ought to be left to sort out the details, of the laws passed by the People, like they increasingly have to, in Switzerland. That’s the only exclusivity they should pretend to. In truth, business creators are nothing much. Business creators motivated first by money are even less. Piketty to Bill Gates: ‘If 30 years ago, one would have told you: you will earn one billion dollars, not 50 billion, would you have refused to invent Windows?’ Of course not says Piketty, answering his own question. Piketty: Without counting that all these innovations rest on an ecosystem of public research. Piketty missed the obvious remark that France was at the forefront of the electronics age: transistors and CPUs (chips), and even the Personal Computer (PC), were all invented, and produced first in France. He probably does not even know this. And the fact he does not know is testimony enough to the dirty ways of money. The hard creative work is from engineers, scientists and the philosophers who back them up, not forgetting the historians, sociologists, writers, artists and poets helping to inspire the preceding crowd. Such labs are now starved by austerity. If you ask people at Apple Inc. why they are so good, they don’t say “Steve Jobs”. It’s not just that Steve has experienced technical difficulties, it’s that Apple engineers feel empowered. Apple has $700 billion in market cap (twice Google). 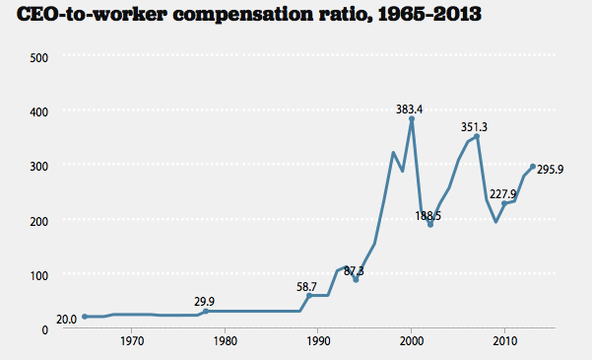 After a level of inequality, it has no effect on the motivation of individuals: why to pay traders millions of Euros? Say Piketty. What I say is that much of trading itself, should not exist. Much of what Piketty says about Europe and the Euro Zone is correct. One should homogenize the core part of the Euro Zone, and those who don’t like it, like Luxembourg, can stay out. Right now in Europe, large companies pay less tax than medium and small ones. It’s even worse with middle class people versus the wealthiest. 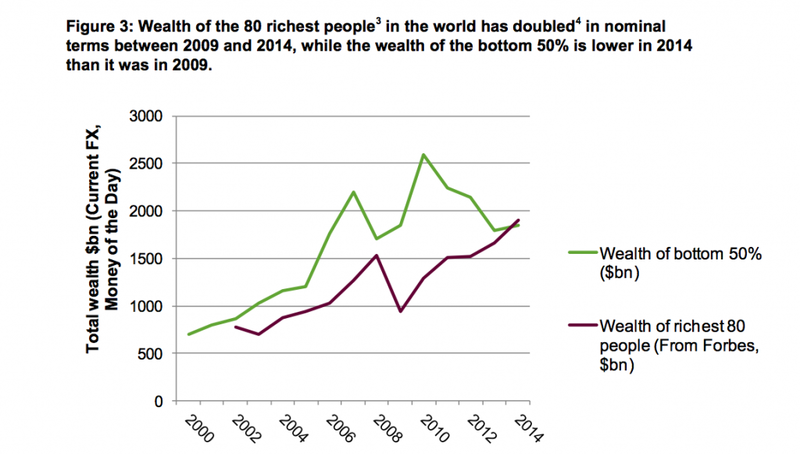 A point Piketty makes is that inequality is not everything, but opacity also matters. He mentioned that Carlos Slims (world’s richest man) obtained juicy contracts from the government. (Piketty is careful not to say that this was a case of obvious corruption; he obviously knows this, but he wants to be keep on being invited in the power circles, and his books to create the buzz that brings millions of sales). 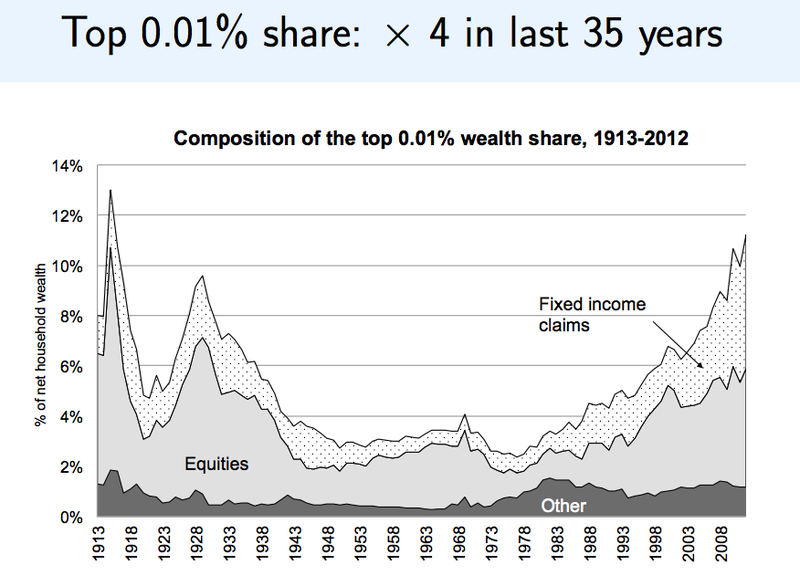 An objection made to Piketty is that the classification of the richest people has changed over 30 years. To this, Piketty has not clear retort, but I do. That is indeed a silly objection: The founder of Walmart passed away. His heir have, all together, more money than Bill Gates. More historically, under the terrible Roman plutocracy, the richest of the rich changed all the time, for similar reasons. But, although it was hard to maintain just as high a status, it was easier to maintain one just below. The Curial class (= local plutocracy) survived for 4 centuries. Karl Marx? Piketty rightly points out that Marx wanted to cancel private property, but did not think about what would happen the next day. Piketty suggests to create new notions of property, including hybrids between public and private property as conceived now. Piketty was asked why he was so keen, him, such a young guy, to go all around the world, to be received by Obama, to be admired by all, etc. … Instead of being working hard? Especially with the crisis we have now? Piketty replied he believed in the power of ideas. He believes politicians are just into doing what they believe is the dominant thinking We The People (he did not use that expression) go by. So, in the democratic debate, one should try to modify this dominant opinion. The answer to this is simple: some play, some think. Real thinkers are not in the White House, they are in distant caves, watching the sea. Occasionally, when not thinking deep. Piketty points out that oligarchic regimes bring social problems, thus scapegoats, thus nationalist drift, and then, ultimately, like Hitler, or Putin, war. All right, truth be told, Piketty did not mention Hitler, but he did mention Putin. Not a word on the problem of banks. Out of 29 extremely dangerous banks, the equivalent of potential super-novas on the verge of explosion, four are French. BNP is roughly the same size as French GDP. Those banks are the main engines of inequality, besides the fact any of them, by imploding would make the situation instantaneously worse than in 2008. Those banks are still allowed to engage in a form of trading which is the modern equivalent of slavery. Piketty does not mention the problem, which is at the core of the money generating-austerity craze. And he is not afraid to say that many of the time honored ways of economics are actually outright insanity (he repeatedly uses the word “delirium”). Piketty is no genius, but he makes an excellent impresario.